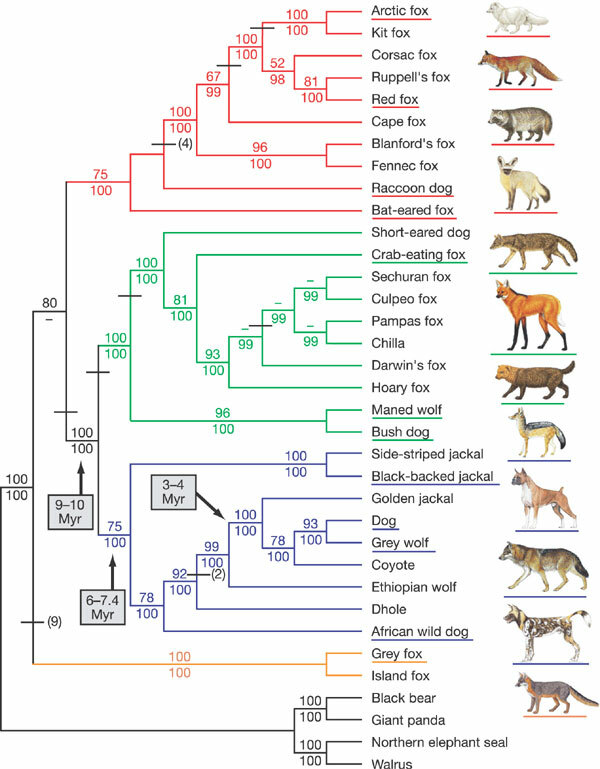 So African wild dogs and dholes are most closely related to the Ethiopian wolf, Golden jackal, and the Holarctic gray wolf boondoggle in the genus Canis. They are more closely related to those canids than the black-backed and side-striped are to those Canids, which means Canis, as currently recognized is a paraphyletic genus. The South American clade wild dogs are a sister lineage to this wolf-like canid clade (which is all the jackals, gray wolf complex, the Ethiopian wolf, and the dhole/African wild dogs). They evolved in North America first then wandered into South America after the forming of the Isthmus of Panama. They became extinct in North America and then became more greatly diversified in South America. The dates probably need to be recalibrated. In the case of the gray wolf and coyote, they definitely need recalibration. Also, this was made before golden jackals were split into two species. One is the Eurasian golden jackal, which is really distinct from gray wolves and domestic dogs. It does not readily hybridize with either. The other is now called the African golden wolf, and no one can agree on what to call it. It is much more closely related to gray wolves than to Eurasian golden jackals.